In the spring of 1904, Matt Wambach and his brother-in-law Nick Zenk turned an old machine shop in Georgetown in the Palm Saloon. From the looks of the place, most of the money went into the beautiful wooden bar. The wooden bar from the Palm Saloon survived in a local basement until the Flood of 1997. The Wambachs are Clay County pioneers who have been close neighbors and friends of the Probstfields since the 1870s. Here we see the Palm Saloon in Georgetown, opened by Matt Wambach in 1904. This entry was posted in Uncategorized on April 5, 2016 by probstfield. The Probstfield family was Progressive in their politics. Randolph and Catherine’s daughter Cornelia was active in the Women’s Suffrage movement. 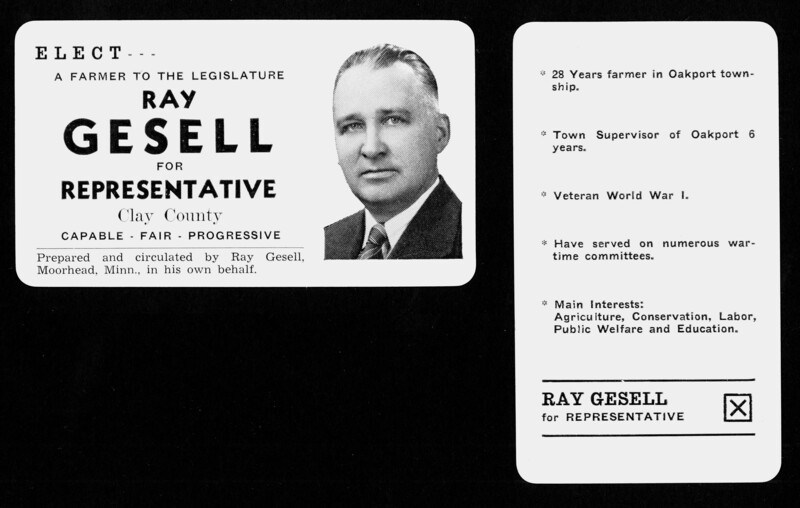 She married and moved to La Crosse but her son, Ray Gesell, returned to the Probstfield Farm in 1916. He was the driving force behind the farm until his death in the 1980s. Although the Women’s Suffrage movement was often Dry in their politics, Cornelia’s father (Randolph) owned a saloon for a time, her brother (Andy) worked in a brewery, and her son (Ray) opened a bar after Prohibition. This entry was posted in Uncategorized on March 29, 2016 by probstfield. Wet and Dry politics played a big role in every election. In 1876, Randolph Probstfield campaigned in saloons for election as the Clay County Sheriff. On November 7, 1876, pioneer farmer Randolph Probstfield, a Wet, wrote in his diary that he was “Handsomely defeated as Sheriff for Clay County” by the Dry incumbent, J.B. Blanchard. This entry was posted in Uncategorized on March 15, 2016 by probstfield. The exhibit starts in 1871 when Moorhead was founded by the Northern Pacific Railway bridge over the Red River. By that time, though, the Probstfields had lived on the Red River Frontier for most of a decade. The exhibit talks about the Wild West tent town of Moorhead but it does not mention that the year before, that tent town was at Probstfield Farm. Everyone thought the railroad would cross at the Probstfield’s place, so all the gamblers and gunmen and townspeople gathered around the house and set up a tent town. Randolph sent the family up to East Grand Forks to get away from the rough characters in the town. When the real site of the railroad bridge was announced, the tent town left Probstfield Farm and went three miles south, creating Moorhead and Fargo. They called the old tent town at Probstfield Farm “Bogusville” from then on. This entry was posted in Uncategorized on March 11, 2016 by probstfield. Probstfield Farm President Markus Krueger helped create a new exhibit at Moorhead’s Hjemkomst Center called “Wet and Dry: Alcohol in Clay County 1871-1937.” The Probstfield family played a central role in the community all through these years. A series of blog posts to follow will highlight the ways in which Randolph Probstfield and his children were connected with this era.